Many People Have Used Android Phone, almost Everyone! But can You Imagine Android Phone in PC? I also Not, but I have found amazing software which allows that. Even you can install unlimited Android Phone On Your PC and Laptop. But for unlimited access, you need strong Specification system (PC or Laptop). In Medium or Low PC and Laptop, You Can easily Install 2-3 Android Phones. So, stick with this article and I’m going to guide you on “How to Install Custom Android Phones On PC and Laptop”. Let’s do it. But Before Going to the step by step process, you have to know some important things which mentioned below. RAM: 1.4 GB for 1 Android, 2GB for 2 Android Phone. 1.4 GHz AMD Processor, Intel Duo 1.8 GHz for Single Android. Graphics 64 MB, 256 MB, 512 MB. Windows: Window XP, Window 7, Window 8, 8.1, Window 10. 300 MB for Downloading File. If you Having these things then you are ready to Install Custom Android Phones on Your PC and Laptop. If you are mission any one or two of them, give it a try. Download the File (Nox Player 6) from Here. Just go with the link and Download the Latest Version Nox Player from the Official site. Turn Off Your Window Firewall (Recommended). You must have to Turn Windows Firewall off because it blocks Nox Player. Now Click on the file and install it as “Run as Administrator” mode. This is important for first time Run because such software needs Power Start to Work. 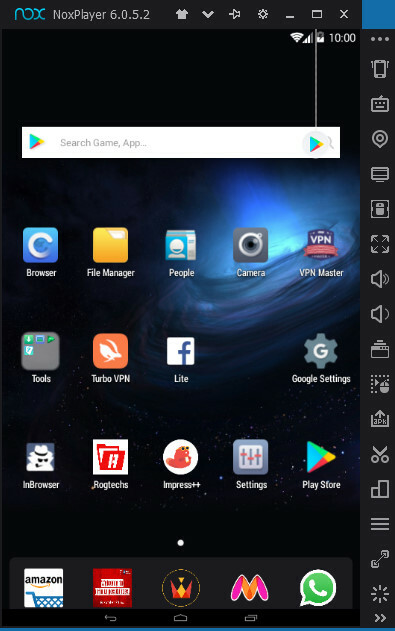 After Complete Installation, Run Nox Player (for Single Default android). And You have to do it for your first Custom Android device, then you can use it and create multiple Androids. Now for Enhancement, Click on the Up head Setting button. 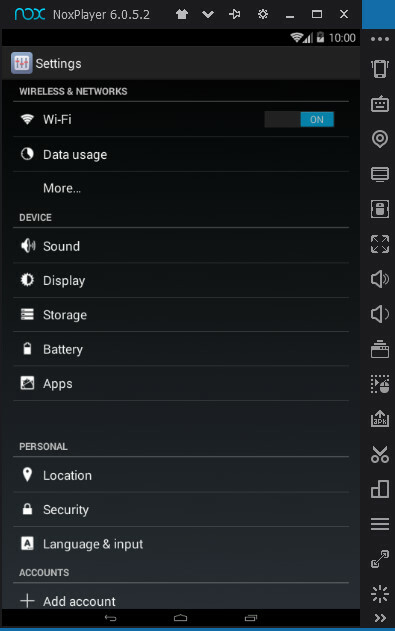 Set Performance Settings at “Low”, Startup Settings at custom- Width 480, Height 800 and DPI 150. Graphics Rendering Mode, Select Speed (DirectX). Set Frame Settings at 20 FPS for Multiple Android Installation. Now, these are for the Single Android Installation, Now Let’s Install Multi Android phones. Click and Run Multi Drive from your Desktop Screen. Once the Nox Player gets installed, the two app shortcut will be generated; Nox Player and Multi Drive. 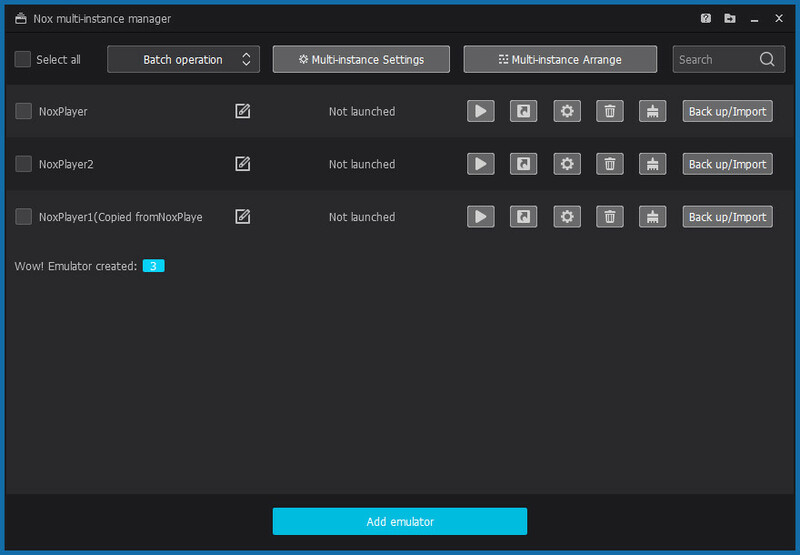 Now click the multi-instance Settings. Remove the Sound Enable Tick Option. Now click to Add Emulator at the bottom. Select the New Android Emulator. Wait for Complete Downloading and Unpacking process, it will take again your 300 MB approx. After that, you can use your second Custom Android Phone. Again, Do set it at low and enhance your second Android Performance. Follow the same steps for Creating another Android. You can Install Android KitKat, Android Lollipop and More on Nox Player. But Remember, it may take more than 300 MB for the latest Android Versions. Through this process, you can install unlimited Custom Android Phones On your PC and Laptop, but one thing you should remember is your PC and Laptop Healths. The system usages graph may increase dramatically and start Damaging. To get the insights of Usage, you can look at Task Manager of Your Windows. So, make sure you are installing Your Custom Android Phone according to your System capabilities. Use this process for your Dream of Having tons of Android. You work on Android will get soo much easier by just having Nox Player active on your Windows PC. You can Use multiple WhatsApp and other apps to take Benefits from. Like Money Making app, social media apps. Also, You can use WhatsApp and Facebook at the same time and many more advantages you can take from it. Don’t Install Custom android more than 2 or 3, It may increase your system usage drastically. But If you have Strong CPU then you can extend the suggested Numbers. Use only KitKat Version of android for better performances. I have tried Lollipop and Marshmallow and I want to tell you that they slow down the System. Make sure you have at least 2.0GHZ and 4Gb of Ram for multiple Custom Android Installation.